Callum Hudson-Odoi, 18, looks set to be prized away from Stamford Bridge. 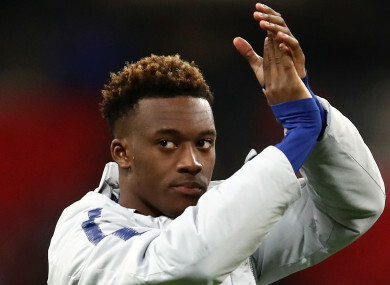 Hudson-Odoi, who has started the Blues’ last two games, is a top January target for the Bundesliga side, with a fourth bid of £35m having been made on Tuesday. Bayern have also offered the 18-year-old the No.10 shirt at the club – a squad number that will be available when Arjen Robben moves on in the summer. He’s a very interesting player that we absolutely want to sign. He has qualities that suit our game. He’s a strong dribbler, fast, and carries a goal threat. Bayern are on the look-out for wingers with Robben confirming he will leave at the end of the season and Salihamidzic admitting on Wednesday “it’s probably going to be Franck [Ribery's] last year”. Jadon Sancho and Reiss Nelson, former England U17 team-mates of Hudson-Odoi, have made a huge impression this season at Borussia Dortmund and Hoffenheim respectively. Speaking after Tuesday’s first-leg defeat to Tottenham in the Carabao Cup semi-finals, Chelsea boss Maurizio Sarri insisted Hudson-Odoi had not been distracted by the speculation. Email “Bayern confirm intention to sign English youngster from Chelsea after making £35m bid”. Feedback on “Bayern confirm intention to sign English youngster from Chelsea after making £35m bid”.